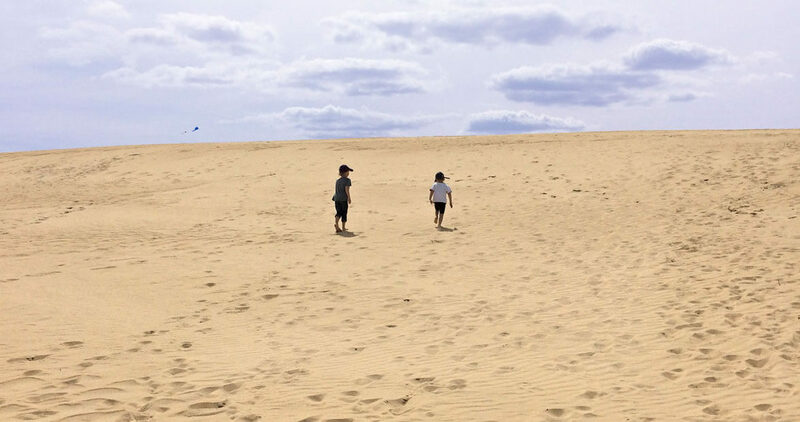 For beachgoers big and small, a trip to Jockey’s Ridge — the largest natural sand dune system on the East Coast — is like visiting a different planet. We’d had a good, long, windy day filled with all things beachy and educational — feet in the chilly water north of Nags Head; aquarium exhibits and ice cream on Jennette’s Pier; a sprinting, manic tour of Kitty Hawk. We were a little worn out. I was, at least. It’s possible that all I really wanted was to go back to the hotel and lie down and stare at the ceiling while the boys jumped on the furniture and failed, I hoped, to break any bones. But I’d made a promise, and the boys were still game, and your word, as my grandfather used to say, is your bond. Plus, we were right there. Surely it’s bad form to drive past the tallest natural sand dune system in the Eastern United States and not get out of the car. Down that walkway then, and to a kind of viewing platform, which was littered with shoes. We took ours off, too. The scale of the place didn’t dawn on us right away. We set out into warm, soft sand. But then we crested the first hill, and The Wee looked around, mouth hanging open. Sand everywhere. He named a desert planet from a globally famous space-opera franchise, the toys from which fill our house. For sure, his older brother said. Definitely. We were absolutely on that planet. That game didn’t last long, though. And I’m not saying I wouldn’t have wanted them to spend the next 90 minutes saving the rebels from the empire. But plain wonder won the day. Bliss, even. A kind of peace rare to these two boys, then 6 and 4 years old, stole over us. They held hands. They climbed. They climbed again. The Wee wanted us to go farther. Can we climb that one, Daddy? he kept saying. Can we do the next one? Yes, I kept answering, until it became a kind of game, and we were all laughing, half-lost, barefoot in the middle of nowhere, and on a very different planet indeed. I spend a good deal of time telling these boys what they’re not allowed to do: Don’t hit your brother, don’t yank on the dog’s face, please for the love of all that is good and holy do not pour milk from the gallon jug by yourself. And out there, at Jockey’s Ridge, I had to tell them no, we can’t go hang gliding. Not yet. But we can watch, I said, and we did: There was some kind of class underway, and we watched while an instructor told a group of seeming believers about how all you really had to do was run into the wind, downhill, and jump. “He’s doing it, Daddy!” The Toad said, yanking on my arm. And he was: He jumped into the wind and glided 40 or 50 yards down the hill. It looked effortless, impossible, and off my two boys went, running, pretending they were flying, too. A group of college kids stopped a game of flag football to let them through. I chased along behind, coming up over a rise every now and then, high enough to catch glimpses of water on either side of the island. It was when I was a little lower, though, that I was the happiest, the most lost — when the dunes rose above me, and the boys were just far enough in front that even if I did yell, they couldn’t quite hear. I watched them go and go. Try to remember this moment, I remember thinking. This empty, astonishing, shifting place. Hang on to this. And I have: I can see them running right now. Perry teaches writing at Elon University. 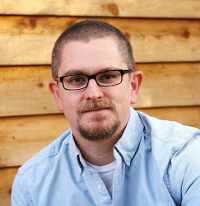 His first novel, This Is Just Exactly Like You, was a finalist for the Flaherty-Dunnan prize from the Center for Fiction, a Best-of-the-Year pick from The Atlanta Journal Constitution and a SIBA Okra pick. His second, Kids These Days, was an Amazon Best-of-the-Month pick and was named to Kirkus Reviews 'Winter's Best Bets' and 'Books So Funny You're Guaranteed to Laugh' lists. You can purchase a collection of "Adventures with Toad & Wee" at ourstatestore.com.